AN INTRODUCTION TO THE STRING QUARTETS OF ROBERT SIMPSON. Dunelm Records has made something of a speciality of the music of Robert Simpson. No fewer than eight significant works of his have been committed to disc in live performances since 1993. 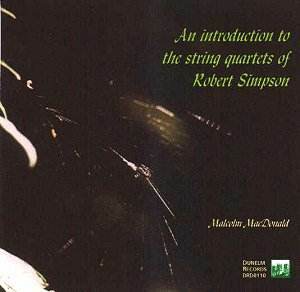 In that year it produced a CD/cassette introducing Simpson�s eleven symphonies in a talk by Malcolm MacDonald; now Mr. MacDonald turns his attention to Simpson�s fifteen string quartets in a talk generously illustrated, mostly by recordings from the Hyperion series, and recorded in association with the Robert Simpson Society. Mr. MacDonald sees the quartets as five groups of three, chronologically and developmentally, and puts his arguments accordingly. Their similarities with Beethoven, especially of Nos. 4 to 6, consciously modelled on the Rasumovskys, are explored in considerable detail. Nielsen and Haydn were other influences, though Simpson was very much his own man. All in all this release is essential listening for all interested in Simpson�s quartets and should also be heard by those yet to be acquainted with them. It is excellently produced; the booklet/insert contains a thoughtful essay by Mr. MacDonald, an "introduction to an introduction", I suppose. Simpson�s quartets are much less frequently heard in live concerts than Shostakovich�s fifteen or Bartók�s six but they are a comparable achievement. This issue will, I hope, argue their case and is strongly recommended.